It's not easy to get good pics here. Postberg is only open to the public in the flower season and Parks Board officials discourage visitors from walking in the veld. 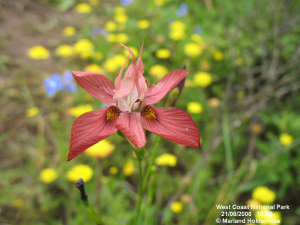 More here: https://www.pacificbulbsociety.org/pbswiki/index.php/MoraeaSpeciesFive "A very desirable color is the brick red form found in the West Coast near Darling."